I’m a scientist by education, but also an information technology enthusiast with software engineering skills — with a focus on code quality, maintainability, and clear concepts. I have strong expertise and interest in data analysis and IT infrastructure (machines, networks, scalable and distributed systems, fault tolerance), and love to take an academic approach to any challenge thrown at me. I constantly learn and like to discover new things! literature/article recommendations on IT topics. profiles at Bitbucket, GitHub, Stack Overflow. I have created and deployed IT solutions of various kinds during my work as a scientist, as an open source software developer, and as a freelancer. Likewise, I have a long-standing history of applying and extending my competence in this field, including community and project management expertise. I perfectly identify myself with the Laziness-Impatience-Hubris triangle and appreciate the Unix Philosophy. Scientific skepticism, critical thinking, and the rules of logic and empiricism are my guide lines. gipc, providing gevent-cooperative child processes and inter-process communication. Used by Quantopian, Ajenti, Chronology, GDriveFS and others. WP-GeSHi-Highlight, a syntax highlighting plugin for WordPress, used by more than 1.000 websites. python-cmdline-bootstrap, a structure template for Python command line applications, simplifying release and distribution via setuptools/PyPI/pip for Python 2 and 3. Much more to be found in the technology category of my blog. Songkick events for Google’s Knowledge Graph, extracts tour dates for a certain artist from Songkick and converts the data to a special JSON-LD format, applicable for showing events in Google’s Knowledge Graph. Used by Milky Chance, The Black Feathers and others. timegaps, a command line program for thinning out a collection of items, whereas the “time gaps” between accepted items become larger with increasing age of items. Useful for implementing backup retention policies. molecular-structure-comparison, a Python framework for analyzing molecular structures, featuring, for instance, a DBSCAN clustering method with automatic parameter optimization, and a simple PDB file format parser. beautiful-readme, creating a mobile-friendly static website from your README file. clobi, a job scheduling system supporting virtual machines in multiple Infrastructure-as-a-Service computing clouds, developed in the course of my Google Summer of Code 2009. AWSAC, Amazon Web Services for ATLAS Computing. Fotobatch, for renaming, resizing, and turning many digital photos with only one click. Keks, a highly decoupled micro job queuing system based on Python, Redis, and gevent. Schlonz, a Python program for building modern static image galleries using cutting-edge HTML5 techniques and some of the best Lightbox and image gallery techniques available. latexletter, a Python module that provides a simple abstraction for the creation of LaTeX letters based on template files. Galleria Classicmod, a free theme for Galleria, providing, among others, a fullscreen option. 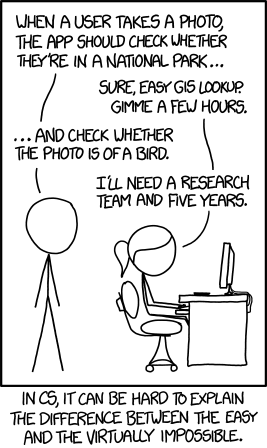 http://xkcd.com/1425 — typical conflict at the science-technology-boundary.